The Cuisinart Mini-Prep Plus 4-Cup Food Processor helps to tackle food processing jobs big and small. This small but mighty processor makes it easy to chop, grind, puree, emulsify, and even blend all your favorite foods. It features a 4-cup work bowl with a measure pour lid, to measure and add ingredients without removing the cover. The processor has 2 speeds with pulse activation plus exclusive auto-reversing SmartPower blades for even more processing options. A 250W motor with stainless steel blades make light work of nearly any processing task, and the dishwasher safe parts make clean up a breeze when you're all done. 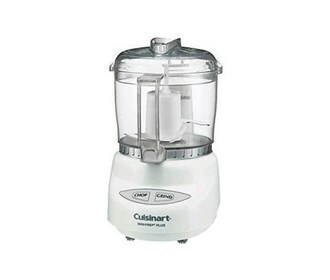 The Cuisinart 4 Cup Mini Chopper White has many exciting features for users of all types. You can extend the lifetime of your Cuisinart 4 Cup Mini Chopper White with the purchase of a FactoryOutletStore Factory Protection Plan.